Our Virtual School of Art brings young people together and builds strong relationships across communities. We are working across Oxfordshire to deliver art workshops in partnership with Oxfordshire Virtual School for Looked After Children. 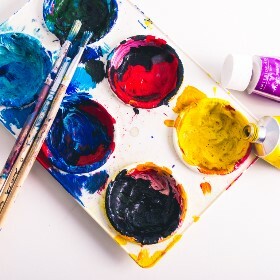 These workshops involve making series of artworks using a range of techniques from graffiti, printmaking through to painting and design work. Our workshops are led by artists who are experts in the techniques involved and designed to support the young people to succeed in creating artwork of their own. The workshops will give the young people an opportunity to feel a sense of achievement and give them fresh experiences of the different jobs available in the art world.